Duncan - New Smooth Rubberized Finish! When Duncan started working on a new kendama they wanted to make something that would be great for balance tricks without sacrificing basic performance. And that is exactly what their newest model gives you! 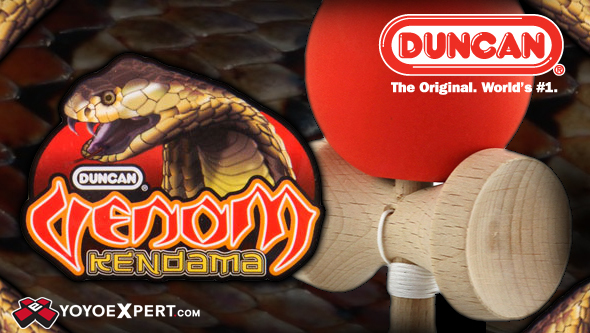 This is The Duncan Venom Kendama! Rubberized finishes can be tricky, some of the rubberized kendamas out there are just too sticky which is great for balance tricks but makes some basic tricks even harder. Duncan created the Venom with that in mind - to make something that is smooth yet grippy, and they nailed it! The one of a kind rubberized satin-like finish on the Venom has a really unique smooth feeling that is grippy without being too sticky. The Venom Kendama is a solid choice for any kendama player, beginner or expert, looking to take their game to the next level!